The tremendous nutritional demands of the human heart are unceasing. We’ve answered the call with our 150 mg CoQ10 + Lecithin. This union of natural heart-friendly synergists is an excellent way to ensure that your hard-working vascular system has what it needs to keep you at your pinnacle. Clinical studies including Karlson 1986, Zierz 1989and a host of others have demonstrated the effectiveness of CoQ10 in the defense against free radicals. 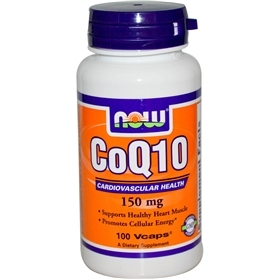 NOW COQ10 helps support overall cardiovascular health and improve physical energy and stamina. It is a is a powerful antioxidant, supports immune health, lowers blood pressure, & protects the heart & gums. Statin drugs deplete COQ10, so take this vital nutrient to protect your heart & increase energy. Suggested Use: As a dietary supplement, take 1 Vcap® daily, preferably with meals. NOW® CoQ10 is Pharmaceutical (USP) Grade. NOW uses only the 100% natural, all-trans form of CoQ10.